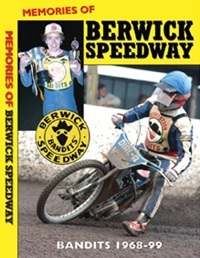 This brand new DVD box set covers the history of the Berwick Bandits from 1968 until 1999. Trying to fit 32 seasons of speedway into one DVD would have been impossible, so the team at Retro-Speedway have split their film over three discs, all lasting around two hours. The DVDs follow the Bandits through their first spell at Shielfield Park (1968-1980), their nomadic 1981 season, their adventures in the countryside at Berrington Lough (1982-1995) and back to Shielfield in 1996. The story stops at the end of the last millennium, with the Bandits competing in the Premier League under the stewardship of Peter Waite. We see the Bandits in action at both home and away - from Edinburgh and Glasgow, right down to Poole and Exeter. Generally there are a couple of races from each meeting included, either the ones that contain the best racing or the ones that are the most significant. Berwick were founder members of the British League Division 2 in 1968. It was new territory for the sport and a real gamble for Danny and Elizabeth Taylor to open a track just south of the Scottish border. Who would have believed then that the Bandits would still be running almost fifty years later? The intervening years have been rather eventful and there's a rich history for the producers to harvest. As you would expect, in the pre-VHS years, not too many Bandits meetings were committed to film. Thankfully there were always a few cine enthusiasts around to capture some of the action. The Bandits haven't enjoyed great on-track success over the years, though the late seventies and early eighties brought cup and individual success. There's footage of both Wayne Brown and Steve McDermott winning the National League Riders Championship, much to the surprise of the commentator who seems unaware of just how talented these boys from the north were. In between those individual successes (in 1980 and 1983 respectively) the Bandits went through some real hard times. Their football club landlords serviced them notice to quit Shielfield Park and the Bandits were left homeless. They started the 1981 season at Barrow but failed to attract sufficient support to make it pay, so they de-camped to Glasgow's Blantyre home for a few weeks. Complaints from a neighbouring promotion forced them out of Blantyre and out of the National League. Despite this, they continued to appear in the KO Cup, reaching the final and staging their 'home' leg at Newcastle! They eventually lost out to Edinburgh in a meeting staged well into November. One other rare highlight in that 1981 season was the visit from the Wimbledon Dons, still one of the sport's glamour teams at that stage. The Dons visited Barrow and found things rather more difficult than they may have expected, particularly due to a barnstorming performance from the legendary Rob Grant. The "Woolly Bully" rode the Park Road circuit better than virtually anybody else and his enthusiastic racing caught some of the Dons by surprise. Thankfully the cameras were present and we can see highlights from the meeting in one of these DVDs. The 1982 season saw the Bandits back nearer home, operating out of a field in the middle of nowhere. The track was hidden away in farmland a few miles from Berwick and finding the track remained an adventure in itself for infrequent visitors. At first there wasn't much more than a track and a safety fence, but over the years a smart and compact stadium was built and the Bandits had a home of their own. We're reminded that the club adopted a rather different attitude during some of those years at Berrington Lough, taking a much more hard-nosed approach to the sport, both in team-building and in making things as difficult for visitors as possible. This was no doubt partly inspired by the success their neighbours Newcastle had enjoyed by taking a similar approach. We see a few on-track confrontations with visiting sides, generally whichever southern teams were in contention for league honours. Many great riders turned out for the Bandits during the eighties at Berrington Lough. Bandits fans will have fond memories of the likes of Bruce Cribb; Steve McDermott; Charlie McKinna; Jimmy McMillan; Brian Collins; George Hunter; David Walsh; Mark Courtney; Andy Campbell and David Blackburn. There were also cult-heroes like the aforementioned Rob Grant; Mike Caroline; Phil Kynman and Alan 'Pop' Rivett. Those National League days between 1982 and 1990 at 'the Lough' were a happy time and the club was generally free of financial problems. Quite a number of meetings were videoed during that period and crop up on here. The most remarkable season in the Bandits' history was undoubtedly 1991. Terry Lindon was a relatively new promoter and took the brave/foolhardy decision to take the club into the all new British League Division One. In order to become competitive he had to recruit some big names to lead the side and shocked the speedway world by signing Kelvin Tatum, Jimmy Nilsen and Richard Knight. The season is covered in a good deal of depth on the DVD, from Tatum signing at a pre-season function, right through to a farcical 60-0 win over Belle Vue at the season's end. A season that's fondly remembered, though not always for what happened on the track. There was a price to pay for those happy memories and the club slipped back into the Second Division for 1992 then out of the league entirely in 1993. A few end of season junior meetings were held in '93 to keep interest alive and the new third division in 1994 offered a route back into League speedway. Sadly the successful years that the Bandits spent in the Conference League in the mid-nineties are rather skipped over, with so many years to cover it's perhaps inevitable that something had to give. We do see the final competitive race from Berrington Lough, a win for veteran Glyn Taylor (of the Stoke Potters) after home favourite Kevin Little had broken down. The first heat of the 1996 season is also included, a significant one as it was the first race at Shielfield Park since 1980. David Blackburn won that one, riding for the Bandits once more as part of a short-lived comeback. One of the best races on the whole DVD also came from that 1996 season as Richard Emson produces a thrilling chase around the Shielfield shale. A reminder of the undoubted potential that Emson possessed, potential that remained unfulfilled as he drifted out of the sport just a few years later. The return to Shielfield Park is covered in some depth, including video of the noise test the previous summer that paved the way for the sport to return. It's evident from that film just how much work was required before the speedway could re-open, the whole stadium seeming to have fallen into a bad state of repair. Unlike some of the other "Memories of...." DVDs, there are no new interviews on this production. Those that are included were either recorded at the meetings featured, or were recorded by Dennis McCleary during the club's silver jubilee season. The McCleary interviews are excellent and include Mark Hall (the club's first captain), Kenny Taylor (promoter for many years) and Ian Patterson (Bandits rider who now runs the excellent Cinders to Shale museum). There are a few horrific crashes included in the package, notably a career ending injury for Mikael Blixt (in the Gold Cup Final at Oxford) and a horrible incident at Berrington where we see Jon Gould's machine flying over the fence and narrowly missing a spectator. There's plenty here for any fan of the Bandits to enjoy and it will be of interest to all those who have enjoyed visiting Berwick over the years. The six hours include so many interesting stories, races, meetings and riders that it fully justifies the running time, if anything you are left wanting even more. Hopefully a follow-up covering the Bandits' adventures in the current century can be produced at some stage in the future.